Information submitted in a nomination letter to the U.S. National Ski Hall of Fame by Paul Robbins and Richard Wagner. At the 1993 F.I.S. World Championships in Morioka, Japan, AJ Kitt (his first name always just two capital letters) took the bronze medal in downhill. In 11 seasons on the World Cup circuit, he had a half-dozen top three finishes and 21 top ten finishes while competing in over 100 events from 1988 to 1998. Determined, committed and intense in spirit, AJ became the first American male alpine skier to race in four Olympics. Born in Rochester, New York in 1968, AJ Kitt’s parents were ski instructors at Swain Ski Center. Kitt had small wooden skis at age two and he started racing at six in Genesee Valley Ski Council circuit. AJ made the unusual leap from the national team’s training group right to the World Cup circuit in 1988. He led the resurgence of the U.S. team during the 1990s, one of the first bright lights since the great U.S. teams of the mid-1980s, a leader and inspiration of a men’s team reclaiming a place among the top World Cup nations. 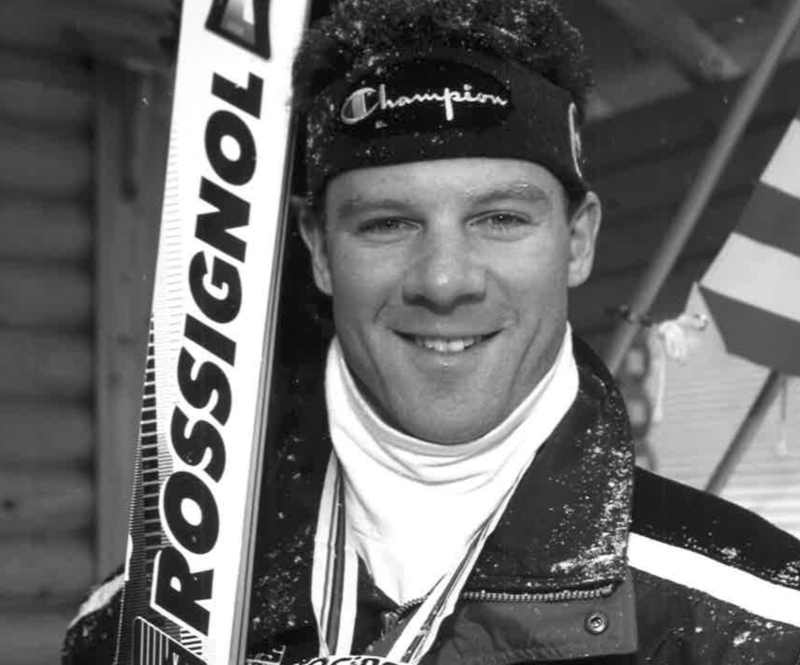 Kitt’s success lifted team spirit and U.S. prestige, beginning with his win in the opening World Cup downhill race at Val d’Isere in the 1992 Olympic season. He finished second in the renowned Hahnenkamm World Cup Downhill at Kitzbuhel, Austria and was third overall in downhill points for the 1992 World Cup season. AJ competed in the 1988, 1992, 1994 and 1998 Olympic Winter Games, placing ninth in the Olympic downhill at Albertville, France in 1992. In F.I.S. World Championships, he competed in 1989, 1991, 1993 and 1997, competing for medals in eight Olympic Games and World Championships despite two major injuries. Kitt also raced on the King of the Mountain pro tour with Tommy Moe, the two being runners-up in the team standing for skiers in the U.S. Ski Team pipeline. Living in Hood River, Oregon, AJ is a national ambassador for the NASTAR program. In 2002, he won the Bill Berry Award for outstanding service in the media for the sport of skiing. AJ Kitt was elected to the U.S. National Ski Hall of Fame in 2003. If you notice any errors or inconsistencies in AJ Kitt's bio, click here to let us know.